One of the pleasures of Gabriel Josipovici’s What Ever Happened to Modernism? is that it all but forces us — dares us, even — to argue with it. Josipovici presents an idiosyncratic definition of Modernism, he perceives the struggles of Modernist writers and artists as fundamentally spiritual, and he frames it all by describing his disenchantment with most of the critically-lauded British fiction of the last few decades, a disenchantment that he ascribes to such fiction’s attachment to non-Modernist 19th century desires. The only readers likely to agree with Josipovici’s general view, then, are readers who accept his terms and share his tastes. Such readers are probably few, and they are also the readers who least need the book. It is those of us who may be sympathetic to one or another of Josipovici’s general arguments who really need it, because it is a powerfully clarifying volume, especially in its extended discussions of particular works. “Modernism” is one of those terms that has been used in so many different ways, with so many different meanings, that anyone seeking to discuss it must first define it. In general, it is seen as both a tendency and an era, a style of artistic expression mostly occurring in the twentieth century, though with some examples or precursors in the latter part of the 19th century. Josipovici rejects all of this, for while his paragons of Modernism do fit the general periodizing, his definition of the term is far broader, and is not particularly interested in situating Modernism within borders of time. In the first chapter, he defines Modernism as “the coming into awareness by art of its precarious status and responsibilities” , a definition that is further refined to see Modernism as a response to the post-Medieval European world’s disenchantments. Modernism reveals itself in the “century of pain, anxiety, and despair on the part of writers, painters, and composers” , which Josipovici details with examples from Mallarmé, Hugo von Hofmannsthal, Kafka, and Beckett. The pain, anxiety, and despair come from an unresolvable tension between an overwhelming desire to write and a doubt in art’s ability to represent the world. This tension inscribes itself in the texts, undermining or even shattering the enchanting verisimilitude of, for instance, Victorian novelists such as Dickens. Josipovici begins What Ever Happened to Modernism? with a preface in which he tells the story of being an undergraduate student, hearing a lecture about “The English Novel Today”, seeking out the recommended writers (Anthony Powell, Angus Wilson, Iris Murdoch), and feeling a lack: “They told entertaining stories wittily or darkly or with sensationalist panache, and they obviously wrote well, but theirs were not novels which touched me to the core of my being, as had those of Kafka and Proust” (ix). He goes on to discover Borges and Claude Simon, Alain Robbe-Grillet, Saul Bellow, Georges Perec, and Aharon Appelfeld — all writers whose work he admires — but feels more and more of an outsider within English literary culture. “Occasionally I wondered why my own feelings and those of reviewers or critics were so much at odds, wondered, indeed, who was right, me or the entire establishment. I didn’t think I was mad (though of course the mad rarely do), and I did occasionally meet people who shared my tastes, so how was this anomaly to be explained? Within the question itself we can glimpse the kernels of Josipovici’s argument, assumptions, and desires. He sets up a polarity: “Who was right, me or the entire establishment?” It’s a feeling many intelligent and thoughtful people have asked (often in their youth) for centuries, and the frustration it provides can be productive, particularly in helping people define their tastes, but in and of itself it’s humorous in its naivety. The claim that What Ever Happened to Modernism? is an attempt to answer the question of why Josipovici’s experiences as a reader are different from those of people who don’t share his tastes may be true in terms of intention — he may have thought that was what he was trying to do — but it is false as a description of the book’s value, because Josipovici shows no interest in trying to understand tastes that differ from his own. He truly doesn’t seem to be able to understand how people of even moderate intelligence and education could find themselves touched to the core of their beings by works that he himself doesn’t respond strongly to, and which seem to him “to belong to a different and inferior world to that of Proust and the others” (x). Not just different, but inferior. It should not surprise us, then, when Josipovici defines a central element of Modernism as “pain, anxiety, and despair” resulting from European culture’s growing rationalism and waning faith in unquestioned authorities and eternal verities. Over the course of the Middle Ages, perceptions of reality changed. Individualism took hold. Capitalism infiltrated economies. The Enlightenment solidified, expanded, and complexified the disenchantment, and then Romanticism reflected on it. The Victorian novel, that form which Josipovici so disdains, sought to re-enchant the world with the legerdemain of its reality effects, the verisimilitude that lulls the reader into imagined reality. Such a reality is unquestioned, unified — it does not admit the problems of representation in a fallen and fragmented world. Its pains, anxieties, and despairs are not those of the Modernist, but of the illusionist. Josipovici’s question “Who was right, me or the establishment?” is simultaneously a cliche of individualism (the absolute individualist, unburdened by doubts, answers, perhaps with a copy of The Fountainhead in hand, “ME!”) and an expression of the assumption that prevents Josipovici from empathizing with any view other than his own, because the assumption underlying the question is that there is a right and a wrong, and that this right and wrong can be discovered and elucidated. The first chapters of the book are the weakest, because it is in them that Josipovici attempts to predict criticisms to his arguments, but he is so convinced that those criticisms must be wrong (different and inferior) that what he offers as representations of them are ridiculous: a quote from Evelyn Waugh about Picasso, a parody of Marxism (paraphrasing something Josipovici said he heard from a professor at the University of Sussex once), and a caricature of postmodernism that, were someone to represent his own conception of Modernism so badly, Josipovici would laugh off the page. He quotes an astute statement from the art historian T.J. Clark on the difficulties of writing honestly about pre-Enlightenment Europe without sounding nostalgic, but this seems pro forma — Josipovici verges, especially in the first chapters, toward far more nostalgia than Clark’s Farewell to an Idea does, because Josipovici clings to the notion that the fragmentation and dispersal of authority should cause pain, anxiety, and despair. He wants, still, for there to be one right and one wrong, and he sees “the establishment” as a monolithic and invalid authority. After these introductory pages, the book shifts more toward Josipovici’s real strengths — he moves from denigrating the mysterious forces that don’t share his opinions and perceptions to offering his interpretations of specific writers, artists, and works. In its central chapters, What Ever Happened to Modernism? is a tour de force. As the book draws connections between Albrecht Dürer, Rabelais, and Cervantes; Wordsworth and Caspar David Friedrich; Kierkegaard and everyone, the pages sing with insight. Each reader will find different thrills within the rich texture of the text. While I was familiar with some of Josipovici’s ideas about such writers as Cervantes, Kierkegaard, Kafka, and Beckett from his previous essays, I had passed over things he’d written before about Wordsworth, and so his close readings of some of Wordsworth’s most famous and most obscure poems opened those works up to me in ways I had never considered, and sent me back with passion to a writer I’d previously had little interest in. 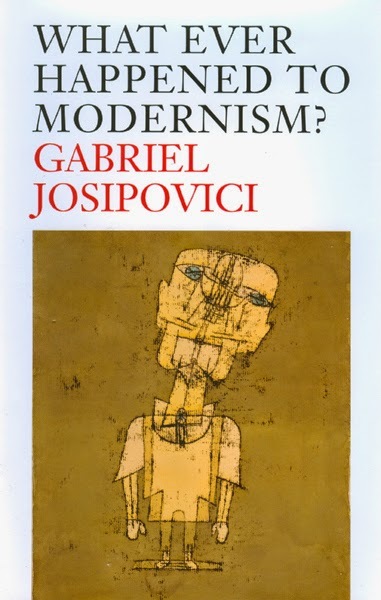 I expect most readers, especially those unfamiliar with the majority of Josipovici’s other books, will, if they can read past the polemic, find similar moments of epiphany in What Ever Happened to Modernism?. By the end of the book, the word “Modernism” seemed to me too narrow for the tendency Josipovici described, because he convincingly shows connections between everything from ancient Greek drama to Herman Melville to Francis Bacon, suggesting that for millennia artists have concerned themselves with, if not Modernism exactly, the impulses and experiences that allow Modernism to fully reveal itself in the 19th century. What Josipovici describes is not an artistic movement or school, but a type of perception and expression present in much of the art that has been considered among the greatest of human accomplishments. The fiesty, proselytizing side of Josipovici tries hard to make it seem that everybody who has ever written about literature hates and misunderstands this tendency, but it may just be that he is uncomfortable on the side of the winners. While Proust, Kafka, Borges, et al may not be quite as popular as J.K. Rowling and Dan Brown right now, they’re a whole lot more widely read than Anthony Powell, Angus Wilson, and Iris Murdoch, and a whole lot more universally beloved than even the contemporary British writers who soak up so much of the journalistic ink that rouses Josipovici’s ire. I suspect, though, that the ire and insights need each other, and that without the passionate sense of being a lone, sane man in a madhouse of philistines, Josipovici may not have been able to make the bold and brilliant interpretive leaps displayed throughout not only What Ever Happened to Modernism?, but his entire oeuvre of essays and fiction. Careful, moderate critics are useful, but it is the fiery, aggrieved ones who scale the highest intellectual heights, and Josipovici has scaled those heights with brio and panache.